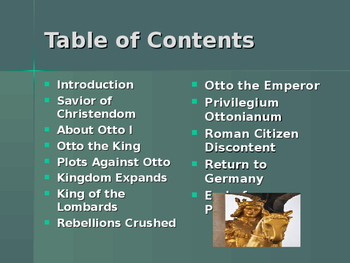 This is a 15 slide, highly animated, power point presentations on The Middle Ages - Key Figures - Otto the Great. Each of the presentation slides are editable so you can change it to fit your individual needs. 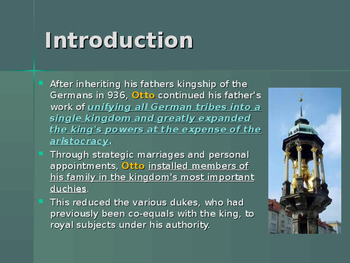 After inheriting his father's kingship of the Germans in 936, Otto continued his father's work of unifying all German tribes into a single kingdom and greatly expanded the king's powers at the expense of the aristocracy. 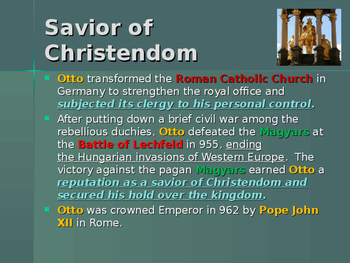 Otto transformed the Roman Catholic Church in Germany to strengthen the royal office and subjected its clergy to his personal control. After putting down a brief civil war among the rebellious duchies, Otto defeated the Magyars at the Battle of Lechfeld in 955, ending the Hungarian invasions of Western Europe. The victory against the pagan Magyars earned Otto a reputation as a savior of Christendom and secured his hold over the kingdom. 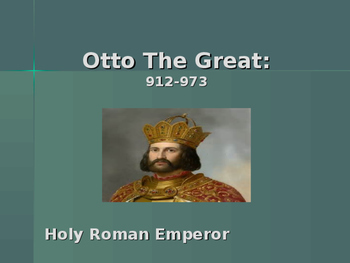 Otto was crowned Emperor in 962 by Pope John XII in Rome. This is one of many power point presentations I offer in my store under the heading.... The Middle Ages.